The typical college experience has been described by the Community College Research Center (CCRC) as having the structure of a cafeteria – though there are many programs, services and activities available, it is often left to the learner to make the choices that will lead them to successful program completion and entry into the workforce. This structure has led to an environment where, even with increased access to postsecondary education, learners, particularly those considered “non-traditional,” are not set up for success. Graduation rates for four-year universities are currently at 59 percent, and for community colleges at a dismal 28 percent. 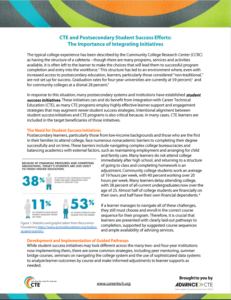 In response to these results, many community colleges have worked with national organizations like CCRC and the American Association of Community Colleges, among others, to develop student success initiatives, focused on increasing equity and degree completion. These initiatives include numerous reforms of college advising and student support services to ensure that postsecondary learners undergo a seamless journey throughout their experience and complete college with a meaningful degree. Unfortunately, too often these initiatives happen in silos, separate from postsecondary CTE initiatives. Today, Advance CTE released a new fact sheet describing how CTE and student success efforts can support each other. For example, a big part of student success initiatives focuses on helping students choose pathways and meta majors – the National Career Clusters Framework has for many years served as a way to group similar pathways together and help students narrow their choices. Additionally, the role of strategies like career advising and employer mentorship have long been crucial parts of CTE programs of study. For more information on how these initiatives can help each other, read the fact sheet today.